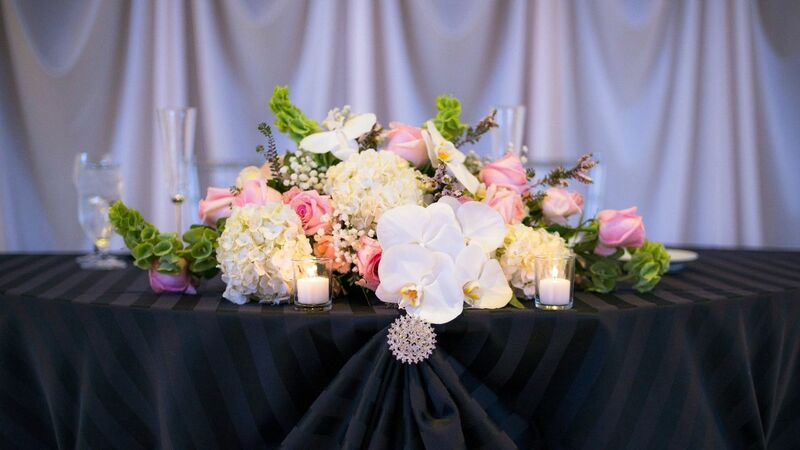 Bring your wedding vision to life in Rosemont’s most elegant venues. 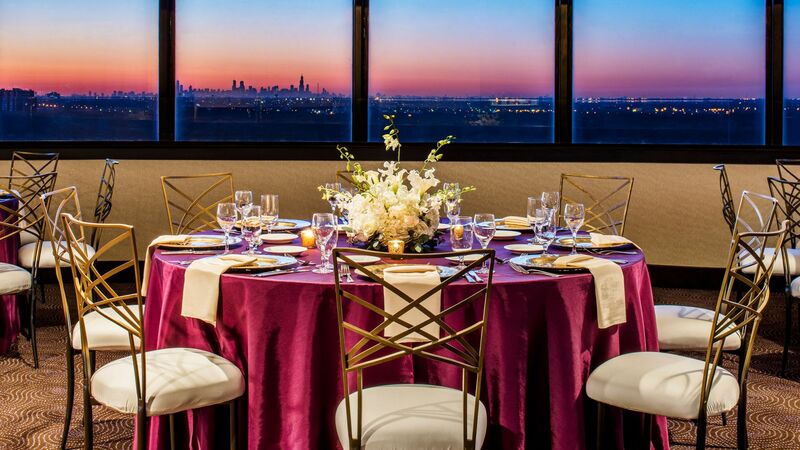 From rehearsal dinners to morning-after brunches, our full-service spaces offer a panoramic view of the Chicago skyline and can accommodate any celebration. With four unique wedding venues and 110,000 square feet of space, our hotel in Rosemont is perfectly equipped to host your special day. From customized menus to ceremony and reception sets, our expert wedding planners will help execute every last detail from start to finish. 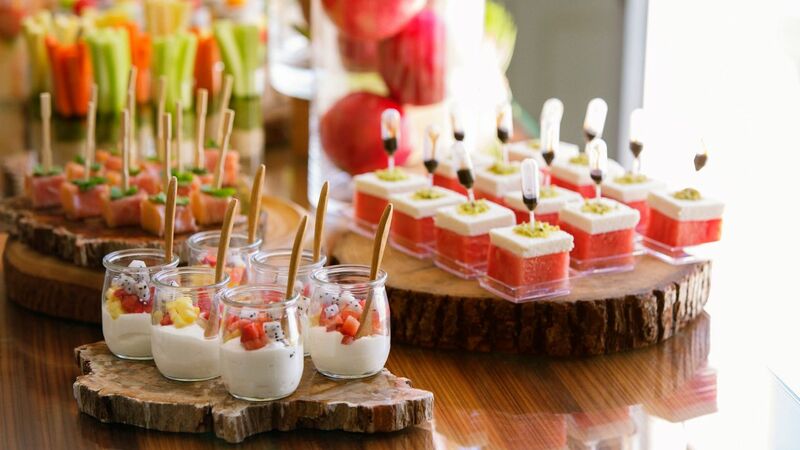 Customize your wedding menu with gourmet dishes crafted by our masterful catering team. Choose from display stations and tray-passed cocktail receptions to traditional buffets and multi-course plated meals. Allow guests to personalize their meal with Personal Preference Dining® from pre-selected entrees chosen by you. Create a celebration that reflects your unique personalities with the help of our thoughtfully designed Chicago honeymoon packages and wedding bundles. The wide and tempting selection of menu options at Hyatt Regency O’Hare gives you the opportunity to customize your celebration and design the wedding celebration of your dreams. Everything you need to turn one of our elegant venues into a romantic wedding site is included, from Champagne toasts to linens, lighting and much more. In addition, the following enhancements are available. Please ask your Hyatt Wedding Professional for more details. Now when you celebrate your wedding day at Hyatt Regency O’Hare, you can enjoy free honeymoon nights at any Hyatt Hotels & Resorts location worldwide — from authentic resorts that capture the essence of the destination to exciting city hotels in 45 countries around the globe. Whichever honeymoon destination you choose, you'll make memories that will last a lifetime, on us. Simply book and hold your wedding at a participating Hyatt hotel by December 31, 2015 and you will earn Hyatt Gold Passport® bonus points redeemable for free nights with no blackout dates at Hyatt Hotels & Resorts worldwide. For more information please contact the hotel for details or click here. 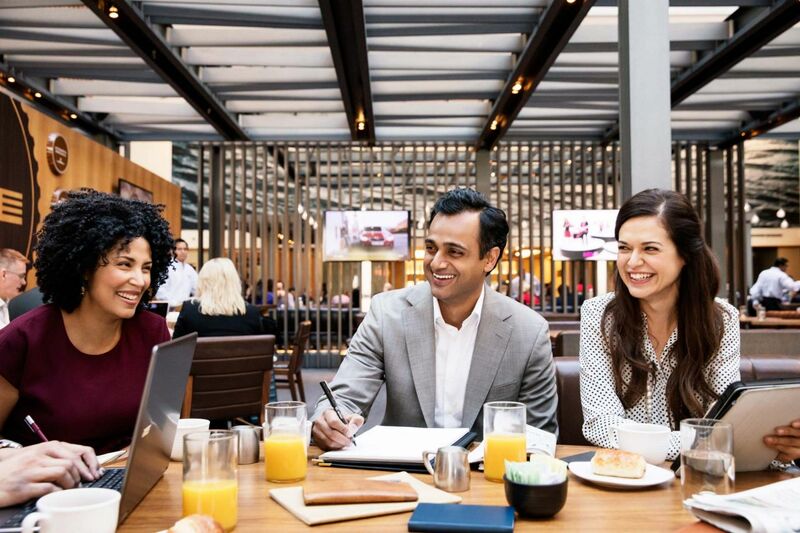 Hyatt Regency O’Hare offers assistance with the coordination of ministers/officiates, floral arrangements, photographers, videographers and entertainment requests. Our extensive experience and resources allow us to handle the arrangements for these services with ease. Can I host a morning-after brunch or a rehearsal dinner at Hyatt Regency O’Hare? Certainly. We have several locations that are appropriate for these occasions at our Chicago wedding venue. We will try and accommodate your guests' requests, however, this will be dependant upon the overall occupancy of the hotel on the day in question. Generally, yes. There will be certain limitations in some rooms, which your wedding specialist can review with you. Allow us to give you ideas and suggestions that have successfully worked in the past at our Chicago wedding venue. Can I have an outside caterer? Yes. We can easily accommodate or recommend outside caterers, as we work with multiple catering companies to ensure authentic Indian and Kosher cuisine can be served on your big day.